I recently had the pleasure of working with Caitlin Hastings, the owner of Botanica, in helping her launch her new website. Botanica offers a selection of pre-potted plants for indoor spaces in addition to customized plant consultations. So freaking smart! I don’t know about you, but I always find a plant I love and then get stuck when it comes to finding the right pot. They’re either way too pricey or I can’t find one that fits the aesthetic I’m going for. Caitlin and I have known each other for a few years and it’s been really exciting to watch her new business grow. Caitlin has this infectious enthusiasm that just brings a smile to your face. I asked her if she’d share with us some of her top recommendations for easy-care plant options along with some other helpful tips! First, tell us a little about you! Hi, I’m Caitlin Hastings! I’m a full-time physician assistant and plant enthusiast with a passion for people and houseplants. Botanica is my way of marrying the two! 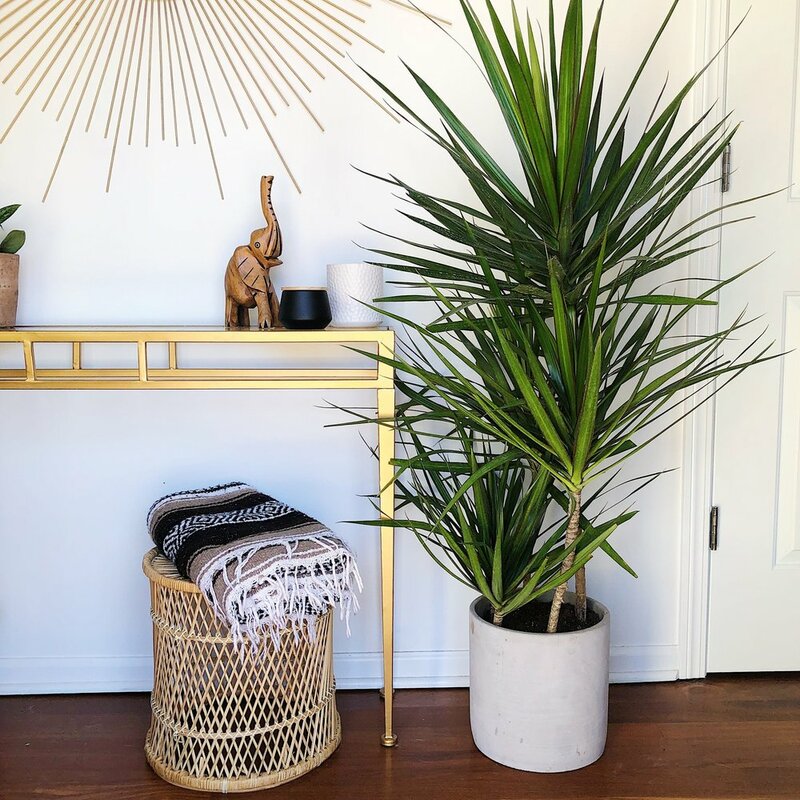 In my own experience of plant shopping, there always seems to be a disconnect between finding the perfect plant for your space, a pot that will match your décor, and most importantly knowing how to keep the plant alive. I strive to make that experience better for everyone by providing low-maintenance plants, modern planters, and detailed care instructions that will turn even the blackest thumb green. I also offer in-home and in-office plant consultations for those who know they want more greenery in their space but just don’t know where to start. Houseplants are my love language, so I enjoy being able to help people at any point along their plant journey. What are your top five low-maintenance plant recommendations for shop owners? My go-to options are the snake plant, rubber plant, pothos, dragon tree, and the ZZ plant. Here’s a little more info about each! There’s a reason everyone you know has a snake plant. They’re virtually impossible to kill. They are simplistic, trendy, and come in many beautiful varieties and colors. Light: Tolerant of low light or bright, indirect light. Water: Let top inch of soil dry before watering. This is a type of succulent, so don’t over-water. Less is more! Qualities: it purifies air by removing formaldehyde and nitrogen oxide emitted from large gas-burning appliances. These plants are the less-finicky family member of the infamous Fiddle Leaf Fig. Rubber plants have dark, waxy leaves that give a nice contrast to a room full of bright green plants. 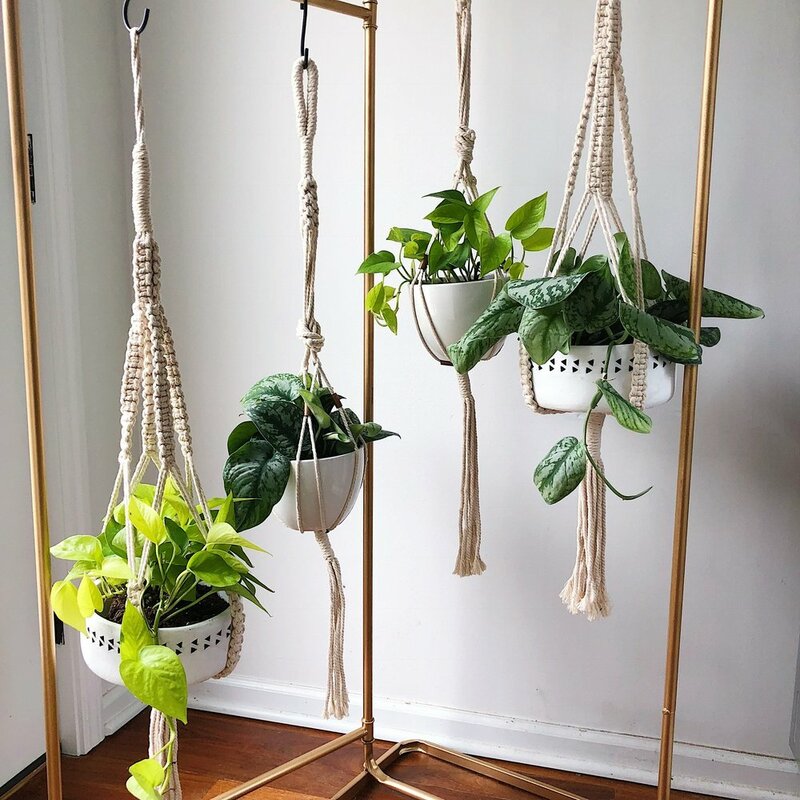 There are many varieties of pothos plants, and each one is beautiful and unique. These plants are known for their long, viney branches that can trail for up to 10 feet long. These work great in a hanging planter or on top of a tall surface where the leaves can trail towards the floor. Qualities: Purifies air by removing formaldehyde. These plants are quickly becoming the trendy, cost-effective, and lower-maintenance alternative to the Fiddle Leaf Fig. With the appearance of a pom-pom situated on top of a skinny meandering tree trunks, dragon trees can slowly make their way up to 10 feet tall. Qualities: Purifies air by removing formaldehyde, benzene, toluene, and xylene. This plant can survive even the blackest of green thumbs! Water it, or don’t. Give it lots of sunlight, or don’t. The ZZ plant is extremely resilient and makes a great starter plant. Water: Let top inch of soil dry before watering. This plant has a succulent-like root system, so don’t over-water. Less is more! Any other helpful tips we should know? Know your plant’s needs, such as light and water requirements. Contrary to what one may think, over-watering is the easiest way to kill a plant. To avoid over-watering, make sure your pots have drainage holes— and if they don’t—you can always add a 2 inch layer of rocks/pebbles to the bottom of your pot prior to adding the plant and soil. This will help avoid root rot which occurs when plant roots sit in standing water at the bottom of the pot and essentially drown. You can repot your houseplants every two years and upgrade to a larger pot to keep them from getting root-bound. When plants become root-bound in a pot that is now too small for them, it stunts any further growth because the roots no longer have room to grow. When re-potting both new or old plants, always break up the roots before transplanting in new soil to promote new growth. Rotate/turn your plants every few months to promote even growth. Plants have a tendency to grow towards light coming in from windows and can often become lopsided. Always water your houseplants less during the winters months. Due to the lower temperatures and sunlight not being as hot during winter months, plants go into their dormant growing period and do not require as much water as usual. Do you have any great resources for good looking pots online? For those of you in the Birmingham area, you can shop my pots at botanicabhm.com. And for those of you in other cities, check out your local plant shops! I have also found some really great selections at Target, Hobby Lobby, or West Elm. What plant are you crushing on right now and why do you love it so much? I love my Nerve Plant aka Fittonia albivenis! (pictured below) It has the most mesmerizing pattern on its leaves and it totally tells you when it needs to be watered. It is quite the diva though! It will go from perky and happy to sad and wilted literally overnight and you will think you’ve killed it. No worries—it’s just letting you know that it’s ready for a drink! Caitlin!!!! Thank you for all these tips. I’m feeling much more confident and inspired to can keep my new little plant friends thriving. You can follow Botanica over on Instagram and learn more about Caitlin and Botanica here.